This is a new ZoomFloppy package v2.0 that include a new release of OpenCBM and the ZoomFloppy Firmware v0.7. Add support for IEEE-488 drives. Implemented by Thomas Winkler. Add experimental support for 1571 serial nibbling via the SRQ protocol. Now you don’t need a parallel cable with a 1571. Implemented by Arnd Menge. Add support for low-level drive analysis with a 1541 index-hole sensor. This works only on drives with a parallel port and nibtools. Bugfix: cbmcopy -r or cbmread now no longer hangs at the end of a transfer. Bugfix: don’t reset the bus twice if previous command was interrupted and this command is “cbmctrl reset”. Bugfix: increase reset time to 100 ms to be sure all drives are reset. Linux build fix for more modern kernels. 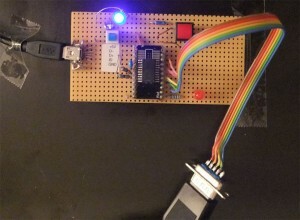 This project by Frank Buß is a cheap solution to connect a digital joystick to a PC using the USB interface. The interface uses Freescale microcontroller that will simulate a USB keyboard and translates the joystick signals to keyboard signals. The support of the IEEE-488 protocol (thanks to Tommy Winkler) is officially part of OpenCBM distibution. You can find newest source code for ZoomFloppy in the Opencbm GIT repository. Device detection for 3040, 4040, 8050, 8250, SFD-1001 (as 8250). D64COPY for 4040 (thanks to TNT) and 2031. D82COPY for 8050, 8250 and SFD-1001. 0.7 (2011/5/10) – Add IEEE-488 support (thanks to Tommy Winkler). 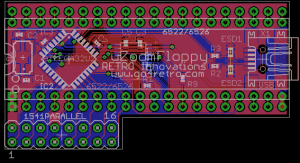 Micro ZoomFloppy is a reduced version of the ZoomFloppy interface. The interface Micro ZoomFloppy will sit in the 6522 IC socket of the Commodore Floppy Drive and provides the complete ZoomFloppy functionality. The only external connection is a USB connector. ZoomFloppy is an USB device for connecting Commodore disk drives to your PC. The ZoomFloppy is an improvement based on XU1541 from Till Harbaum. Nate Lawson and Jim Brain teamed up to produce a professional product. This controller will support IEC drives, IEEE-488 drives and a user-port connection for parallel speeder drives. Compatible with USB 2.0 (high-speed). Powered by USB interface (approx. 500mA). Drive requires it’s own power. Shugart (with extensions) drive interface. 34-pin dual-row header connector. Developed with 3.5″ Samsung SFD-321 and 5.25″ Newtronics D509 drives and compatibles. Other types of drives and media (such as 3″) currently under investigation. Connection of two drives supported using a dual floppy cable, one can be accessed at a time. USB-64 – Turning Commodore 64 into a USB host for Mass Storage Drives. 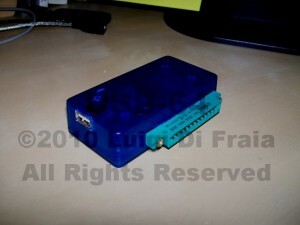 A cartridge to provide software and commands to operate the USB device. A user-port device that interfaces with the USB stick. With the proto-type it is possible to transfer files at 1.2 kB/s (serial) or 9.5 kB/s parallel.